I dipped into the first of the one hour BBC Gardener's World programmes on Friday evening - and saw plenty to interest me! The new 60 minute format was a success in my view, and I can see a lot more gardeners commandeering the remote control on Fiday evenings at 8pm. I followed the part of the programme where Sarah Raven was explaining how she grew her sweet p eas, and was nodding in approval at her summary of the rootrainers in particular. If you haven't already used these hinged plug trays before, you really don't know what you're missing. 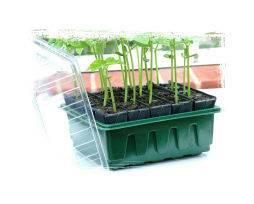 It's been well documented that they're ideal for deep rooting seedlings - such as sweet peas - but the design of the cells encourage any plant to produce a healthy and extensive root system in the shortest time possible. I've used the rootrainers on many occasions in our own Kitchen Garden, and I'm always delighted with the results - in fact, I've got some sweetcorn on the go at the moment which is almost ready for planting out, and I'll be sowing some more runner and french bean seeds in them any day now. I was also interested to see that Sarah also rates the Flexi-Tie for securing tender plant stems to canes or other supports. This is another product that I've used regularly in the Kitchen Garden and as such, I'm a real fan. It's easy to use, won't wound the stem and has - like the best garden products - an endless list of uses. I'll definitely be tuning in to BBC2 next Friday at 8pm to see what other products I can spot, and I'm sure you will be too!